Ring Wars Carolina: Upcoming Event: "Unfinished Business"
If you attended our last RWC show you saw that there are ALOT of unanswered questions, Victor Andrews after months and months of attacks and screwjobs left the company by last saying "Tell Primetime to send my last check to me in the mail, I'm Out!" what does this mean? Will Victor be back at the next event or is he even coming back at all? 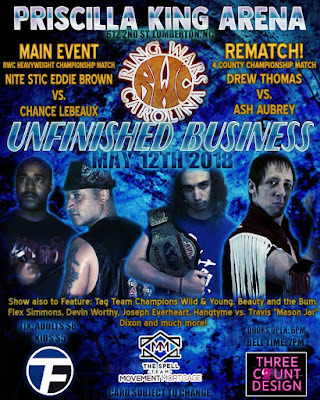 Who is gonna help RWC Heavyweight Champion Eddie Brown's when it comes to Chance Lebeaux & Travis “Mason Jar” Dixon. Both Kris Nemesis & Ash Aubrey lost there Championships at Calling You Out! Kris lost the No Limitz Championship to Flex Simmons & Ash lost the 4 County Championship to "The Undefeated One" Drew Thomas. Will Kris & Ash be looking for rematches ? James Anthony stepped into the ring with Devin Worthy in a Street Fight. Drew grabbed a crutch from under the ring and went to hit James but accidently hit Devin. After the match Devin in a fit of rage pushed down Drew and left the ring. Where does the friendship of Drew and Devin go from here? Event Results: " Calling You Out!"